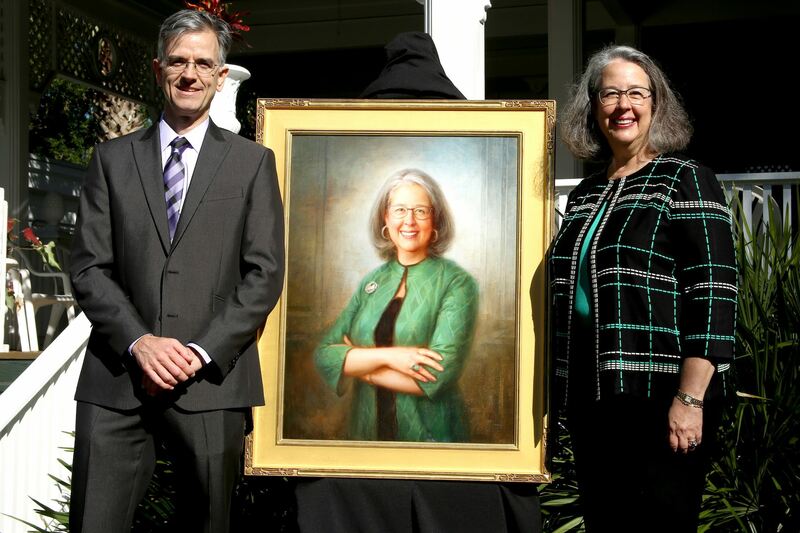 Artist Tom Reis ’88 unveiled the presidential portrait of Stetson’s ninth president, Wendy B. Libby. 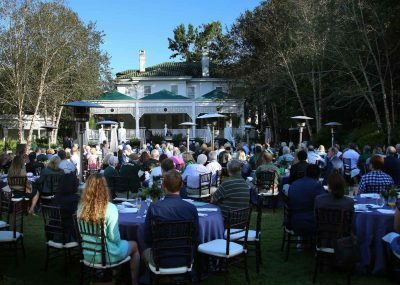 The portrait was unveiled Saturday morning, Nov. 3, during the President’s Champagne Breakfast and Awards Presentation in the Vera Lea Rinker Native Plant Garden at the President’s Home. The portrait will hang in the executive boardroom in DeLand Hall as Libby, Ph.D., serves her 10th year as Stetson president. “We are really here to honor a remarkable person and no less remarkable Stetson president,” Reis said. “I’m proud that the painting will hang in the executive boardroom surrounded by the portraits of a long, distinguished line of presidents whose stature will be greatly heightened by the inclusion of our current president. “And I think the location of the painting will speak to her accomplishments. It will tell that story. But my personal hope is that the painting also communicates at least a small measure of her character – her dignity, kindness, her generosity,” he said. Joe Cooper ’79, MBA ’82, chair of the Stetson Board of Trustees, recalled suggesting the portrait to Libby. 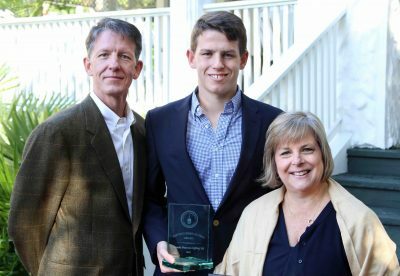 The Distinguished Alumni Award went to Pamela P. Epting ’86, shown with husband Billy, also a 1986 graduate of Stetson, and their youngest, Scott, who is currently enrolled as a undergraduate at Stetson. Libby selected Reis as the painter. Reis graduated from Stetson with a Bachelor of Arts degree in Art and Spanish, and earned a Master of Fine Arts degree from San Francisco Art Institute. Afterward, he worked as a senior art director for JP Morgan Chase in New York City and his illustrations have appeared in many national publications, including Time magazine, Rolling Stone, Sports Illustrated and the Wall Street Journal. The Distinguished Alumni Award to Pamela P. Epting ‘86, who received her B.B.A. in Finance from Stetson and joined the state Department of Banking and Finance, the predecessor to the Florida Office of Financial Regulation. She has served as Deputy Commissioner since 2015, and is currently serving as the Interim Commissioner of the agency. 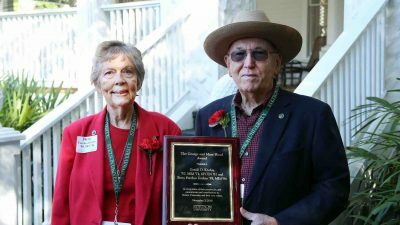 Betty Furches Kruhm and Gerald D. “Jerry” Kruhm received the George and Mary Hood Award. The George and Mary Hood Award, which recognizes an exceptional commitment and contribution to Stetson and its core values, was given to Betty Furches Kruhm ’59, MEd ’86 and Gerald D. “Jerry” Kruhm ’57, MEd ’71, SPCEN ‘81, a Hatter couple with almost a 60-year history of supporting their alma mater. The two have both served on the alumni board, and School of Music Board, and Jerry also served on the Board of Trustees. 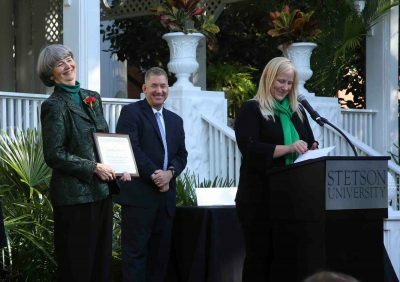 The Distinguished Service Award for dedicated service to the advancement of the university went to Linda Parson Davis ’73, Stetson’s Special Advisor to the President for Philanthropy. Davis will retire on Jan. 31, 2019, following 41 years of service to Stetson, and received a standing ovation from the crowd gathered at Saturday’s breakfast. Linda Parson Davis and Woody O’Cain share a laugh as Rina Tovar Arroyo, Assistant Vice President for Development and Alumni Engagement, announces the Distinguished Service Award. The Doyle E. Carlton Award, which is given to an alumnus or friend of the university for devotion to Christian higher education and extraordinary contributions in the area, went to Basyle “Boz” Tchividjian ‘90, currently a professor of law at Liberty University. A former prosecutor, he has spent a great deal of time focusing on cases involving child abuse and made a difference by helping many church communities address issues around abuse, including by co-founding a nonprofit organization, called GRACE. The Outstanding Young Alumni Award was given to Camiel Canters ’10, MBA ’11. Originally from Curacao, off the coast of Venezuela, he started a Florida-themed apparel company, called Flomotion, after spending time at the beach while attending Stetson and noticing none of the surfers were wearing Florida-themed clothing. Alumni Board President Ray Holley ’91, J.D. 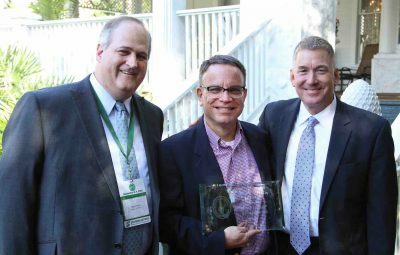 ’97, left, and Woody O’Cain, Assistant Vice President of Alumni and Parent Engagement, right, congratulate Basyle “Boz” Tchividjian ‘90 on receiving the Doyle E. Carlton Award. 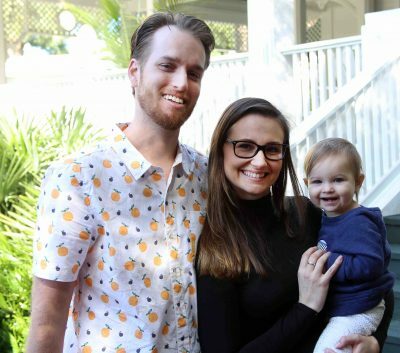 The Outstanding Young Alumni Award went to Camiel Canters, who attended the breakfast with wife Skylar, class of 2013, and their daughter Mila.